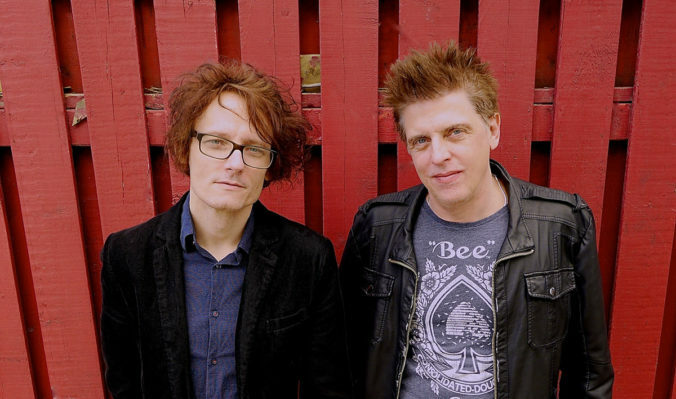 On the surface, they have so much in common that it’s somewhat remarkable that the musical collaboration between The Grapes of Wrath member Kevin Kane and The Northern Pikes’ Bryan Potvin took until 2014 to come to fruition. Both musicians – vocalist-guitarists, at that – found success in the Canadian music business in the late 80’s as residents of Western Canada, with Kane hailing from Kelowna, B.C. and Potvin calling Saskatoon home. In addition to Kane and Potvin each being one of multiple songwriters in their respective groups, another commonality between The Grapes of Wrath and The Northern Pikes is the fact that the groups would each go their separate ways in the first half of the 90’s before ultimately reconvening around the turn of the century. Surprisingly, however, it wasn’t until approximately 2013 when The Grapes of Wrath and the Northern Pikes shared a concert bill in Western Canada that Kane and Potvin started to get to know one another. “Looking back, it’s a little ridiculous that it took so long for us to sit down and get to know each other, considering how much time our respective bands spent on the road in the 80’s and 90’s,” Kane says in advance of the duo’s show at Parkindale Hall this Friday night. Sharing a post-show drink in the hotel bar, Kane and Potvin agreed their respective bands should line up more in the way of shows together. And then for a year, nothing happened, until a chance meeting in a Toronto music store reunited the pair. “It was there that we realized that we actually lived just blocks from one another in Toronto. At the time, Bryan was working on a solo record [2014’s Heartbledwhite]. He came by and played me some of his material; I subsequently shared some of my songs with him. That was really the start of our collaboration,” Kane says. After discovering they shared common musical ground, Kane and Potvin started booking shows together, where each musician would perform his respective material solo. Potvin says that as the shows became more frequent, the amount of time the “other” musician would spend off-stage decreased exponentially. Buoyed by a sense of adventure and excitement, the pair began writing songs together, and eventually booked a week’s worth of studio time with producer Darryl Neudorf to see where their creative muse would lead them. “Going into the studio, we really weren’t sure what was going to happen, but agreed that it was a week of time that we each felt was worth gambling,” Kane says. After successfully cutting five songs in as many days, Kane and Potvin intuitively felt they were onto something special, and decided to launch a crowd-funding campaign to record another five songs, thus ultimately making for a 10-song release. The duo’s record – Kane & Potvin – was released this past October, bearing the sonic hallmarks of their respective pasts while confidently moving the pair in a cohesive new direction. Looking back at the relative lightning speed at which he and Kane have progressed over the last two years – from playing their first show together to having a completed record released – Potvin remains flabbergasted at the efficiency with which everything has unfolded. “Everything has unfolded so naturally with respect to this project. I’ve never been a part of something that has moved as fast as this has the speed we have. It’s nothing that we could have mapped out or anticipated happening,” Potvin offers. When: Friday Jan. 20, 8 p.m. When: Sunday Jan. 22, 3 p.m.
Tickets are $15 in advance, $20 at the door. Advance tickets are available at the venue.